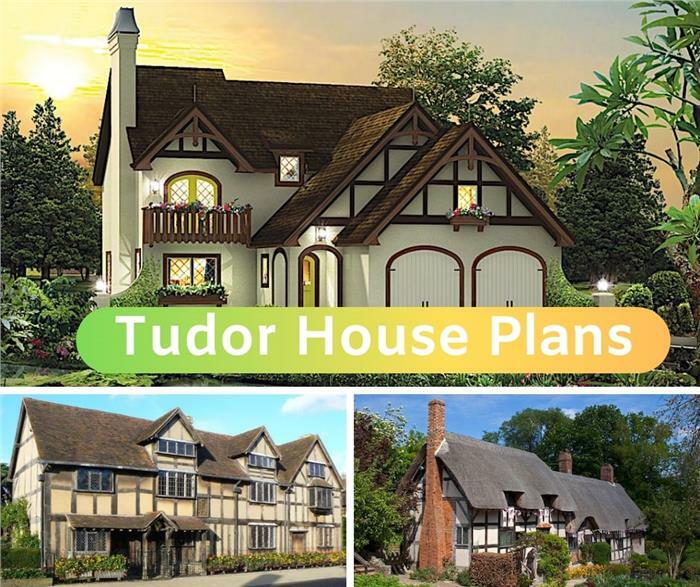 No other design in architectural history has captivated the imagination more than the Tudor style – with its rustic half-timbered exteriors, decorative chimneys, and romantic steeply gabled rooflines. The Tudor home has people rhapsodizing about its Old World charm and storybook appeal. The Tudor style – named after the Tudor Dynasty (1485-1603) – originated in England in the 15th century. During this period, the country was in the midst of a major architectural shift: from the church-inspired Gothic to one influenced by the medieval era and the Italian Renaissance. Instead of the huge cathedral-like Gothic house plans, the English were now moving toward Tudor designs that were smaller but elegant. The style was made more inviting and attractive by its decorative chimneys, sloping rooflines, and half-timbered facades. 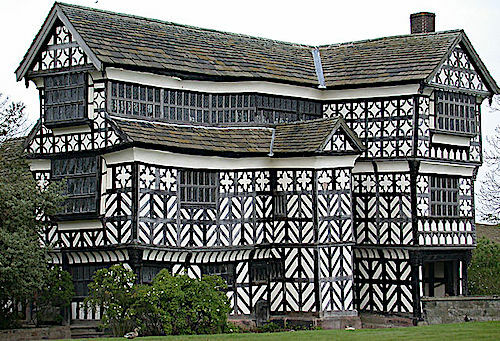 This building, Little Moreton Hall in Chesire, England, is an amazing exampe of Elizabethan-period Tudor timber-framed construction. The manor hall was erected in stages between 1504 and 1562 (photo credit: Little Moreton Hall by Christine-Ann Martin under license CC BY-SA 3.0). While the Tudor design originated with the English nobility and ruling classes, it slowly evolved into one that encompassed “ordinary people” and the “commoner.” In the English hamlets and villages, Tudor homes ranged from simple – sometimes connected – structures with whitewashed wals, exposed timbers, and thatched roofs to the more elegant country homes and castle-like properties of the wealthy and landed gentry. 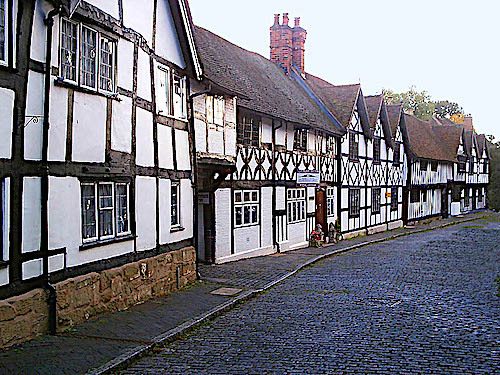 This recent photo depicts a street in Warwick, UK, that shows off historic Tudor houses near River Avon. Much of the area was destroyed in the great fire of 1694, but this neighborhood escaped devestation (photo credit: Public Domain). William Shakespeare lived in what is now one of the most famous-and-most-visited Tudor homes in history, a house believed to have been built around 1529. Shakespeare’s wife, Anne Hathaway, was raised in a beautifully quaint cottage with a lush garden in a little village of Stratford-upon-Avon. 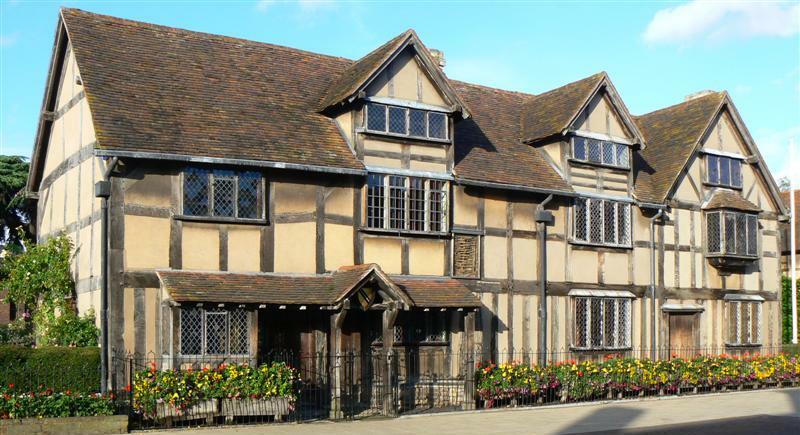 Top: Shakespeare is said to have been born and raised in this Tudor-style home in Stratford-upon-Avon. The home on Henley Street stayed with the family till 1806 (photo credit: William Shakespeare's Birthplace by John under license CC BY 2.0). 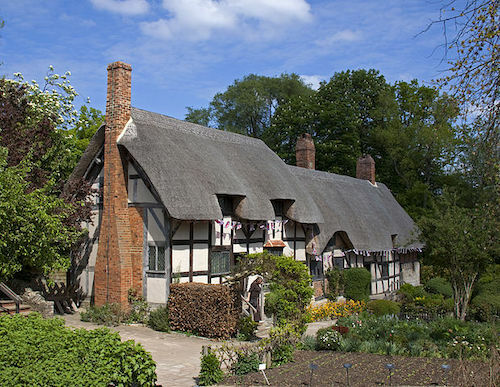 Bottom: In a small hamlet within Stratford, Anne Hathaway, Shakespeare’s wife, lived in this 12-room cottage with thatched roof (photo credit: Anne Hathaway's Cottage by Tony Hisgett under license CC BY 2.0). In North America, architects who were fascinated by the picturesque designs of the English Tudor home and the timber-frame buildings, created their own updated versions – ranging from stately manor homes to more modest “English cottages” and storybook houses. Known as “Tudor Revival” in the U.S., the style started emerging before the Great Depression – when the economy was on the rise. Although it faded in the background after peaking in popularity from 1910 to 1940, the Tudor Revival is still very much in the architectural landscape and loved for its versatility and fanciful flair. Top: This house looks to be straight from a storybook … with gables of alternating heights and a chimney with a chimney pot (Plan #126-1110). 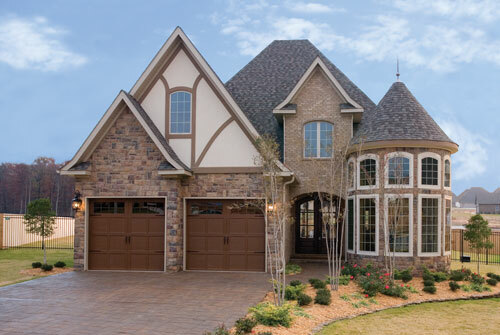 Bottom: Walk through the foyer of this 2-story, 4-bedroom Tudor house plan, and step into a spacious Great Room, perfect for entertaining (Plan #104-1000). Top: Check out this 2-story Tudor style house (Plan #127-1034) with the decorative half-timbering, tall windows, and arched doorway. 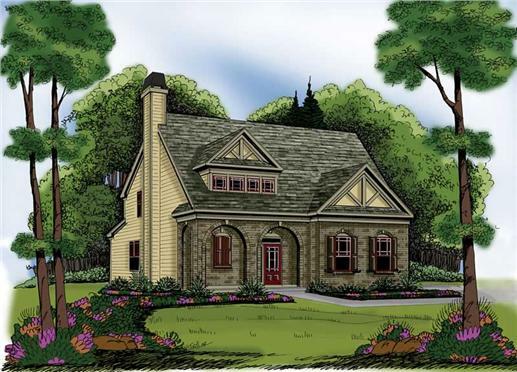 Bottom: This lovely and spacious Tudor home (Plan #153-1715) with landscaped front yard has 4 bedrooms, 2 full bathrooms, a half bath, and a front portico, rear porch, Great Room, large office (or 5th bedroom), and 2 fireplaces (one inside and one outside). 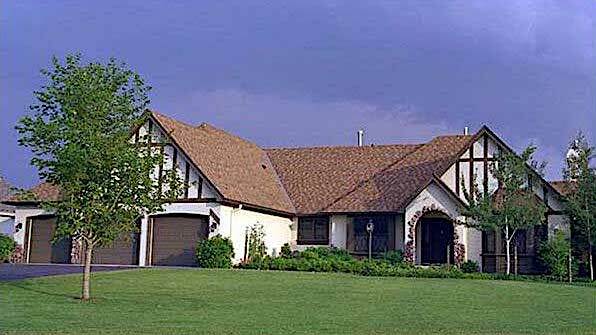 One of the most delightful and whimsical architectural styles, The Tudor Revival house style has figured in numerous films, adaptations of novels, and television series. The Tudor design continues to enthrall those attracted to the English cottage and castles with their turrets and moats. The cottages appeared again in Mulholland Drive (2001) as the Sierra Bonita Apartments. And Walt Disney's fascination with Tudor style architecture didn't stop there. At Anaheim’s Disneyland, Tudor style architecture inspired and graced much of Walt Disney’s Magic Kingdom. One of the more popular novelists of the 19th century, Jane Austen, lived in homes that had traces of the Tudor design – first at the parsonage in Steventon (Hampshire County) and Chawton Cottage. Austen wrote six novels that were a social commentary of her age. Critics and historians applaud “the quick wit, the sharp insight, and the deep emotional intelligence” she brought to Pride and Prejudice, Emma, Sense and Sensibility, Persuasion, Mansfield Park, and Northanger Abbey. When Pride and Prejudice and Sense and Sensibility were adapted for the screen, the set locations were so realistic, you almost expected Elizabeth and Jane Bennet to step out of “Longbourn”; or Elinor and Marianne Dashwood to come out of “Barton Cottage” ready to work in their gardens. More of the Tudor house style is recaptured in the film locations of the critically acclaimed television series “Downton Abbey” – the story of the Crawley family and their servants during the reign of King George V. The family lives in the fictional Downton Abbey – which is really Highclere Castle in Hampshire. 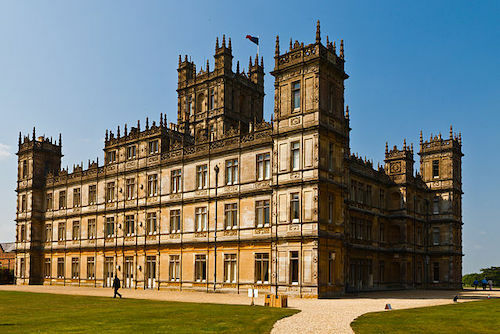 Highclere Castle in Hampshire, UK, is the real “Downton Abbey” and home to the Carnarvon Family (photo credit: Highclere Castle by Richard Munckton under license CC BY 2.0). In addition to the opulent “Abbey,” there are modest homes, which have characteristics of the Tudor style – like the Dower House (below) and Matthew Crawley’s home. 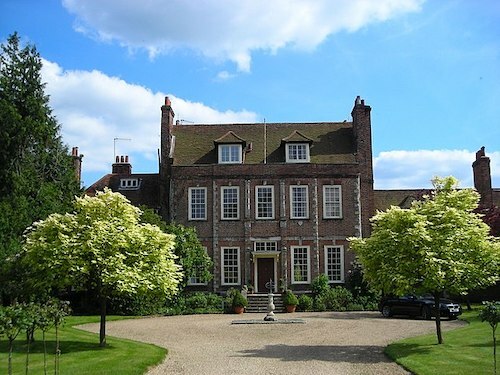 The Dower House in Downton Abbey is actually Byfleet Manor, in Surrey, shown above. It is not really Tudor style, but it does have dormers, tall windows with small panes, and matching chimneys with chimney pots (photo credit: Byfleet Manor House by Mark Percy under license CC BY-SA 2.0). 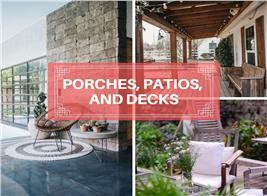 Over the years, the Tudor style shed some of its signature features and a “new look” Tudor emerged. 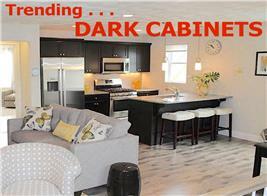 It is now more symmetrical – usually one or two stories – without the half-timbered exteriors. The gabled roof is still around and sometimes, the chimney with chimney pot. 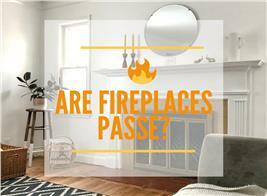 The interiors today often embrace an open floor plan with high ceilings. 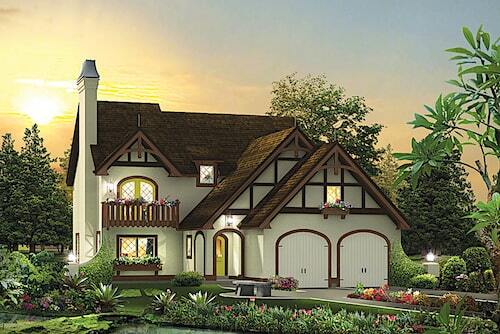 A few “modern” Tudor house plans are shown below. 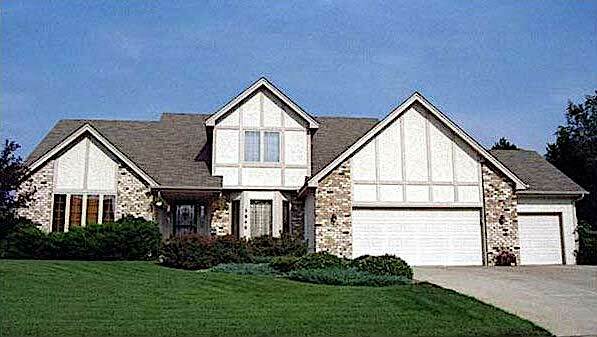 Top: This 2-story, 4-bedroom home (Plan #165-1014) has a stucco-and-brick exterior and an open floor plan. Bottom: Here's a 1-story home with 4 bedrooms and a gourmet kitchen, breakfast nook, family room, fireplace, and library (Plan #165-1124). Top: This 2-story, 3-bedroom updated Tudor house plan boasts an open floor plan and a U-shape kitchen with breakfast nook (Plan #138-1270). 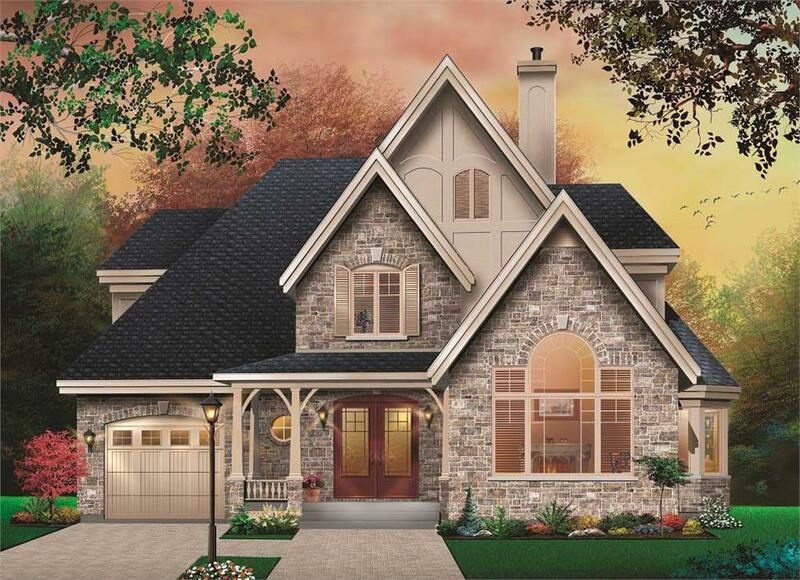 Bottom: A large kitchen with breakfast room is the highlight of this 2-story, 4-bedroom Tudor style house (Plan #168-1063). From the tranquil beauty of Anne Hataway’s cottage to the modern Tudor Revivals all over the world, and in the fictional lives of the rich and not-so-rich, the Tudor style continues its fanciful flair and storybook appeal. 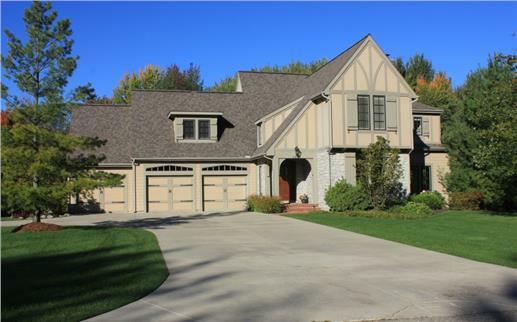 Do you have a favorite Tudor style home from literature or film? Or maybe, just around the block?